For storage, it offers 2 hot swappable bays of HDD or SSD choice. With built-in GV-NVR, this fanless Mobile NVR system supports up to 32 channels of GV-IP megapixel cameras to provide an all-in-one solution (Live View, Playback, Recording, Backup, CMS) for rough conditions. 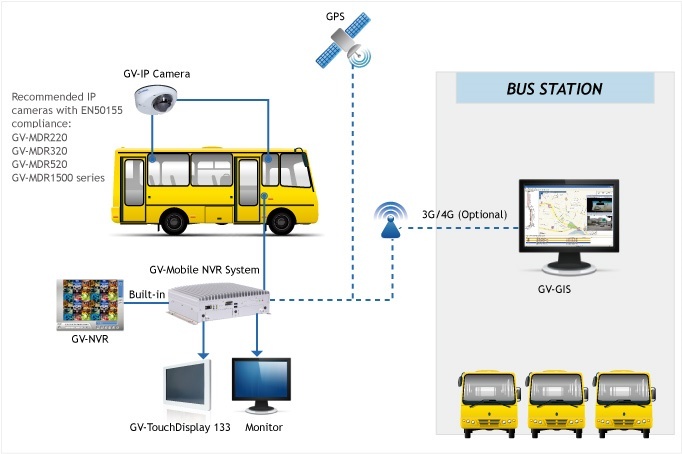 The GV-Mobile NVR System is designed for digital surveillance of transportation. It can be set up in a public transit to record images from the GV-IP cameras installed in the vehicle and connected to dual monitors with one monitor displaying live view and the other displaying alarm-triggering events. The hot-swap storage drives also provide convenient access to recordings and allow data backup in minutes. 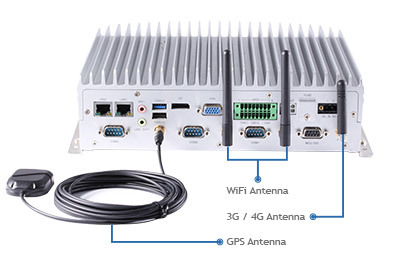 With the GPS receiver, the GV-Mobile NVR System is able to transmit the GPS data collected from the satellite to the GV-GIS(Geographic Information System) through mobile network connection for vehicle tracking. 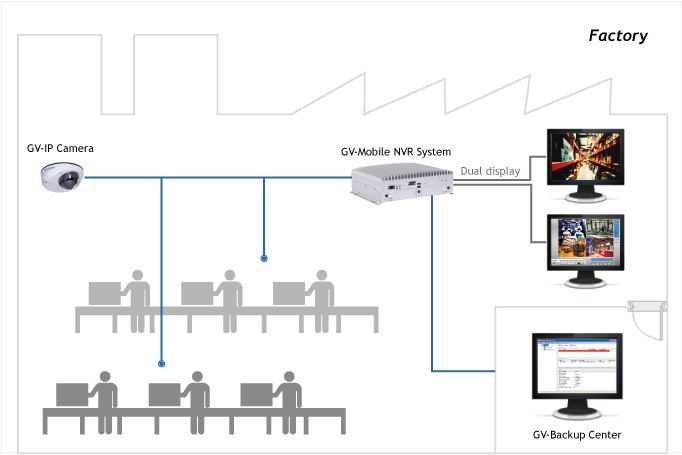 Other than being applied in a public transit, the GV-Mobile NVR can be installed in a fixed and harsh place, such as a factory. In addition, the automatic video backup for the GV-Mobile NVR is made possible by the LAN connection with GV-Backup Center. The GV-FER521 and GV-MDR220 / 320 / 520 / 1500 Series are complied with EN50155 and suitable for the installation with GV-Mobile NVR System. With a mobile device or an Internet browser, you can access the live view and recorded events anywhere. Note: It is required to enable the dual-stream function on GeoVision and third-party IP cameras to have the maximum number of channels supported. For single streaming third-party IP cameras, please see “Maximum Channels and Frame Rate Supported” below. 1. You can freely arrange and switch WiFi and 3G / 4G antennas in ports. 2. GPS module is already built in the GV-Mobile NVR System. WiFi / 3G / 4G modules are optional. GV-Joystick V2 GV-Joystick V2 facilitates the PTZ camera control. It can be either plugged into the GV-Mobile NVR System for independent use or connected to GV-Keyboard V3 to empower the operation. GV-IR Remote Control Controls GV-Mobile NVR System with the Remote Control. GV-TouchDisplay133 The GV-TouchDisplay133 is a 13.3-inch touch panel designed for GV-Mobile NVR System. With the touch panel, you can monitor live images and operate NVR surveillance software by simply touching the screen. Power Adapter Power adapters are available in 4 regions: U.S.A., Australia, U.K and Europe. 3G / 4G Module The 3G or 4G module allows data exchange for the GV-Mobile NVR through the network connection covering wide area. It also empowers the application of GPS for the data transmission to the GV-GIS for real-time vehicle tracking. WiFi Module The WiFi module allows data exchange for the GV-Mobile NVR through wireless network connection within local area. Note: The WiFi / 3G / 4G module will be built in the GV-Mobile NVR System and tested before shipment. Opening the case and installing the accessories yourself will void the warranty.